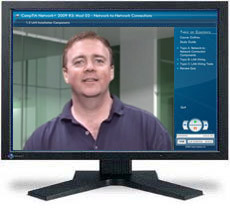 This course is intended for entry-level computer support professionals with basic knowledge of computer hardware, software, and operating systems, who wish to increase their knowledge and understanding of networking concepts and skills to prepare for a career in network support or administration, or to prepare for the CompTIA Network+ N10-005 certification. A typical student in the CompTIA Network+ Certification course should have nine months or more of professional computer support experience as a PC technician or help desk technician. Network experience is helpful but not required; A+ certification or the equivalent skills and knowledge is helpful but not required. An introductory course in a Windows operating system, or equivalent skills and knowledge, is required. Also, the CompTIA A+ certification, or the equivalent skills and knowledge, is helpful but not required. Ken Mayer is a Microsoft Certified Trainer as well as a Certified Ethical Hacker Trainer and Security consultant. He started his career in computer technology in 1980s. He has offered a wide variety of IT training and high level consulting projects for Fortune 500 companies across the United States and Western Europe. He has achieved the Certified Cisco Systems Instructor certification. The CCSI certification involved a two-day lab and observation event held on Cisco in Paris, France Facility. This gave Ken the accreditation to be able to deliver Cisco Authorized Courses as a CCSI. He has taught the full line of Cisco CCNA, CCDA, CCNP, CCDP and CCIP course curriculums, including Cisco’s security appliances such as PIX and IDS.